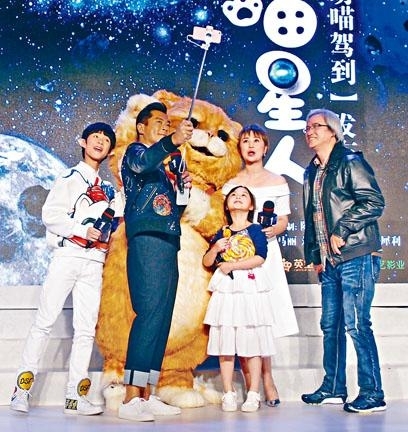 HKSAR Film No Top 10 Box Office: [2016.11.26] LOUIS KOO SAVES THE "NO TAIL CAT"
The Benny Chan Muk Sing directed, Louis Koo Tin Lok starred science fiction comedy MEOW (MIU SING YUN) yesterday held a Beijing press conference. The 180 centimeter tall giant cat was officially unveiled for the first time. Goo Jai led the cat to play games with the audience. He threw a bone off stage and the cat rushed into the audience to find it. It even took someone's selfie stick to take selfies. The more the cat ran though the more tail it lost. After returning to the stage it became a no tail cat! Goo Jai and the director immediately lent a hand and placed the tail back on its proper place.